The mandate (RFS) is costing my company $374,000 a year in additional costs. Ed Anderson, Wendy's | Virginia"
Carl’s Jr. is my American Dream, and the ethanol mandate is putting my dreams at risk. The federal RFS mandate impacts the price of corn, makes food costs volatile, and harms the environment. How? Click on our video to learn more. NCCR submitts comments to the EPA on RFS October 19, 2017. The RFS mandate causes corn prices to increase — setting off a multi-billion-dollar chain reaction throughout the economy that adds costs for farmers, food manufacturers, food retailers and ultimately American families. Can you afford the ethanol tax on your dinner check? 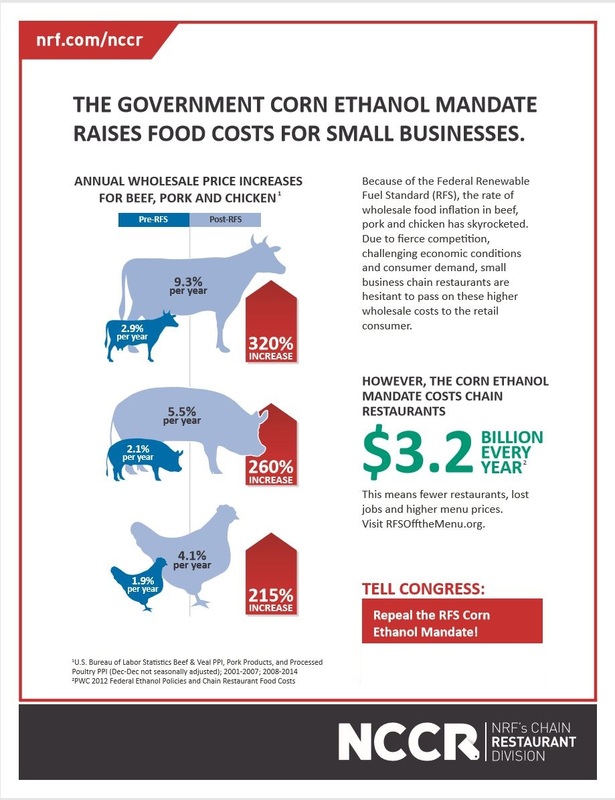 Corn ethanol raises prices for small businesses.